The universe is so impossibly huge that you’re bound to find duplicates, and many stars, planets, or other bodies may, at least on the surface, appear identical. But there are also innumerable outliers that are excitingly unlike their kin. Astronomers have documented many “hot Jupiters,” or gas giants that are super-close to their stars, but KELT-4Ab is special. 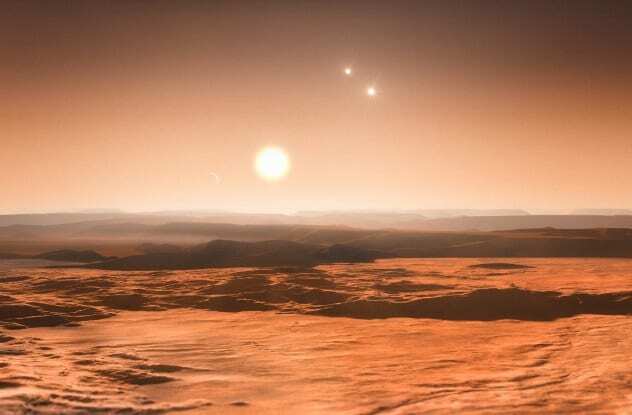 It’s a planet with three suns. It resides in what is known as a hierarchical triple stellar system. KELT-4Ab is about 1.7 times the size of Jupiter, and its main star, KELT-A, would appear 40 times larger than our Sun does in the sky. KELT-A has snagged two smaller stars, KELT-B and KELT-C, which are so far off that they require 4,000 years to complete their orbit. 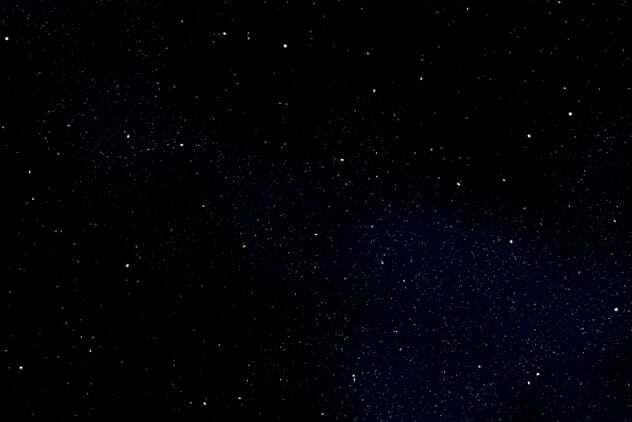 Even at this distance, 328 times farther away than the Earth is from the Sun, the two stars shine with the glory of a full Moon, though through a telescope, they would appear as dots. Most of the things in the solar system travel clockwise around the Sun, retaining the prograde motion of the big disk of dust and gas that birthed them. But little asteroid 2015 BZ509, which shares an orbit with Jupiter, moves in the opposite direction. 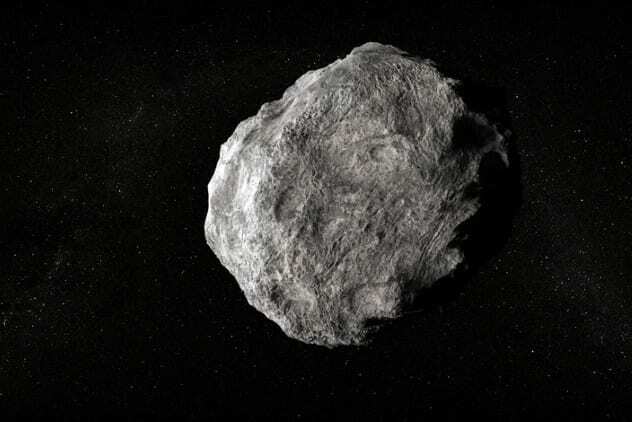 It is the only known asteroid that does so while sharing a planet’s orbit. It should have been kicked out of the solar system long ago, since its retrograde path means that it encounters Jupiter and therefore a massive gravitational tug twice per orbit. But the tiny BZ, just 3 kilometers (1.9 mi) in diameter, serendipitously occupies a trajectory that swings outside of Jupiter’s orbit one time and inside it the next, balancing the net gravitational influence and keeping it in a stable lane for millions of years. Pluto’s mate Charon has all sorts of things going on for such a small body. At 1,200 kilomters (750 mi) in diameter, or half the size of Pluto, astronomers expected to see a cratered but otherwise dull world. But the New Horizons craft revealed the red-smudged moon’s intricate canyon systems, mountains, and evidence of landslides. But some regions are unexpectedly smooth, suggesting that the little body is alive with cryovolcanoes, or ice-spewing volcanoes whose frosty eruptions smooth over the landscape. 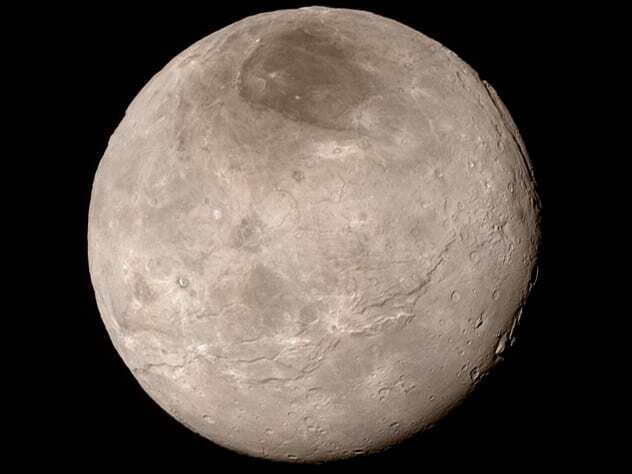 Charon is also scarred by a 1,600-kilometer-long (1,000 mi) network of fractures that stretches across its face and possibly over a good portion of its far side, including a canyon up to five times the depth of the Grand Canyon in parts and four times as long. Stars vary predictably in color, with younger, hotter, bigger stars shining a brilliant blue. 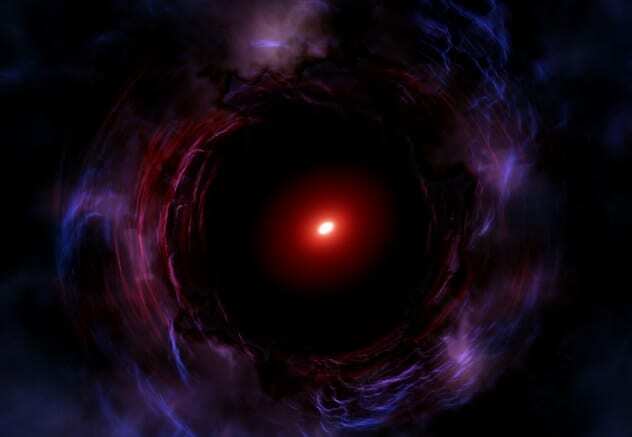 Older, dying stars become redder, and when stellar birth sputters out, their host galaxies glow red. Astronomers have found numerous dead galaxies, but the recently observed ZF-COSMOS-20115 is the oldest yet and is in fact so ancient that it monkey-wrenches galactic evolutionary models. Unexpectedly, it stopped producing stars when the universe was only 1.65 billion years old, even though galaxies during this period should have been bubbling hotpots of star birth. Odder yet, ZF has three times as many stars as the Milky Way, but galaxies from the dawn of time shouldn’t be so massive. Stranger still, astronomers believe that it spawned all its stars during a single starburst event lasting just 100 million years. 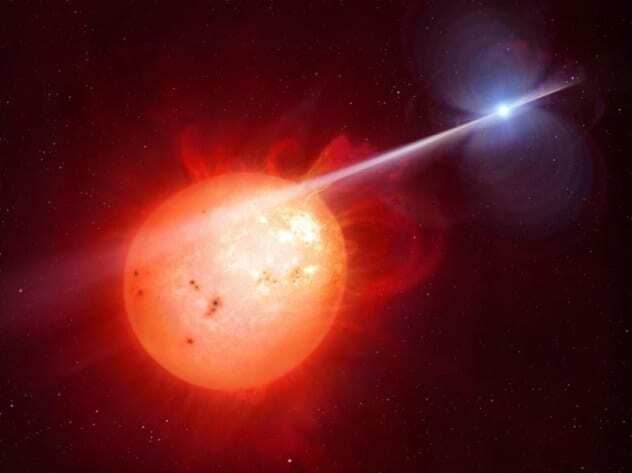 White dwarfs are the burned-out remains of Sun-like stars and virtually dead—except for the recently observed AR Scorpii, a white dwarf emitting hot, radioactive beams like a much more powerful pulsar. AR Scorpii is in a binary system with a red dwarf about a third as massive as the Sun. It hangs a mere 1.4 million kilometers away, and the two bodies complete their speedy orbit in only 3.6 hours. Compared to its buddy red dwarf, AR Scorpii is a mass monster, the size of Earth but containing 200,000 times as much matter. As AR Scorpii whirls a magnetic field 100 million times more potent than Earth’s, its fearsome pulsar-like beams sweep over its partner, accelerating electrons in the red dwarf’s outer reaches to nearly light speed and producing a dazzling light show every two minutes. The Venus-like GJ 1132b, about 39 light-years away, is the most distant Earth-like planet with a confirmed atmosphere. The 1.6-Earth-mass GJ 1132b closely orbits a red dwarf a fifth the size of the Sun and much fainter. It swings every 1.6 days, and as astronomers tracked the planet’s orbit, they found a bulge while looking in infrared, suggesting a thick, water- and methane-rich atmosphere blocking out other wavelengths. More importantly, it’s a huge boost in the hunt for ET. 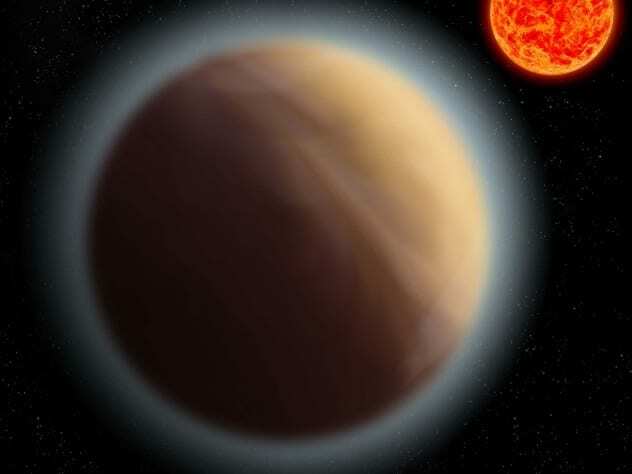 At 370 degrees Celsius (698 °F) GJ 1132b itself is too hot for life as we know it, but the ability to single out bodies with potentially habitable atmospheres will allow the super-telescopes of the near future to focus their gaze on the bodies most likely to bear alien fruit. Gravity sculpts galaxies into many shapes and sizes, but astronomers have never seen one like LEDA 074886, the “emerald-cut” galaxy. It’s surprisingly shoebox-like, and within its quadrangular fuzziness, it hides a gargantuan disk of stars. Astronomers clocked the stellar disk rotating at 33 kilometers per second (21 mps) but can’t ascertain its exact shape because it faces Earth edge-on. LEDA is 70 million light-years from Earth and shares its cosmic living room with 250 other galaxies, giving a clue to its rectangular shape. It may be the result of a merger between two auxiliary galaxies that once belonged to NGC 1407, the local group’s brightest member and possibly LEDA’s accidental papa. Atmospheres don’t usually collapse, but Io’s does. Innermost of the Galilean “Big Four,” Io is smashed by Jupiter’s intense radiation belts but somehow maintains a sulfur dioxide–rich atmosphere, albeit a thin one. 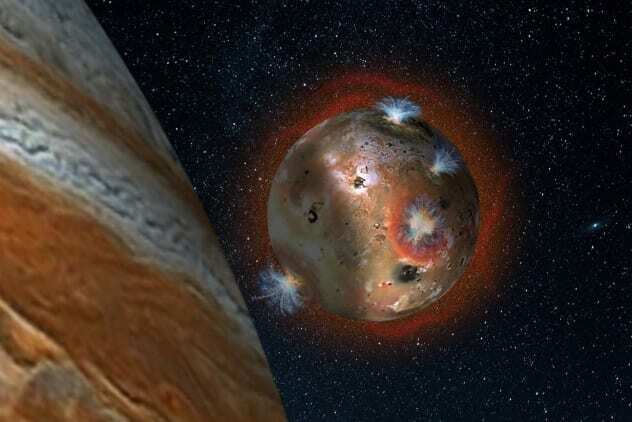 Io is one giant volcano, so its eruptions and vents supply plentiful sulfur dioxide, which falls to the ground as frost whenever Io slides into Jupiter’s shadow. This happens often, as Io completes a Jovian orbit every 1.7 Earth days and spends two hours of each of these in darkness, with the temperature dropping to –168 degrees Fahrenheit (–270 °F). When it peeks back into the sunlight, Io warms up considerably, to an almost balmy –148 degrees Celsius (–235 °F), and the sulfur dioxide ice transforms directly into a gas. Black holes destroy but also create, and for the first time, scientists have observed stars being born from the great outflow of a supermassive black hole 600 million light-years away. 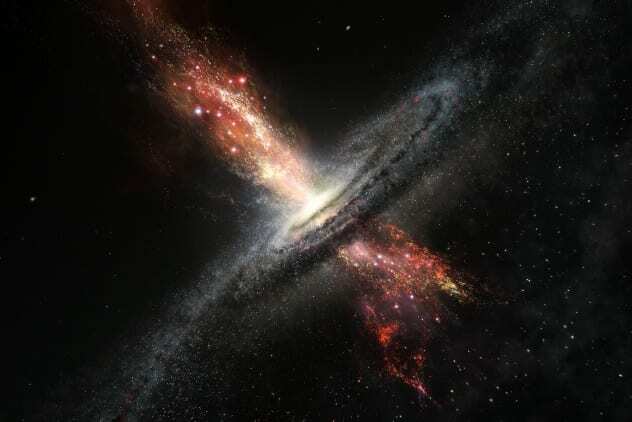 We think of stars emerging from the relatively peaceful gas clouds of stellar nurseries, but now, researchers have confirmed that stars can also be created by the more intense environments surrounding gorging black holes. The black hole in question resides within a messy cosmic construction zone of two merging galaxies, together known as IRAS F23128-5919. Black holes can expel gas at tremendous rates and sterilize galaxies of their star-making stuff, but in the aforementioned case, the tumultuous outflows have become a fertile stellar breeding ground, cranking out extra-hot and extra-bright stars 30 times the mass of the Sun. 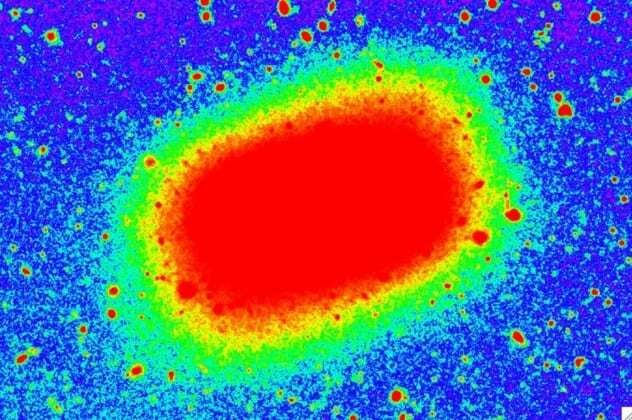 The universe spent its first few hundred million years as an opaque hydrogen cloud, which obscured certain wavelengths of light and blocked our view of the baby-verse. Then, the first stars and galaxies popped up and ionized the gas to transparency. Recently, astronomers observed one of the ancient galaxies they believe might have been responsible, the faintest, tiniest ancient galaxy ever found: the 13.1-billion-year-old MACS1423-z7p64. It existed only 700 million years after the Big Bang, and it’s way tinier and fainter than the other (only four or so) galaxies spied from this time period and was only visible by a chance alignment of a cluster of 155 galaxies, which produced an immense gravitational lens that amplified the light from MACS1423-z7p64.